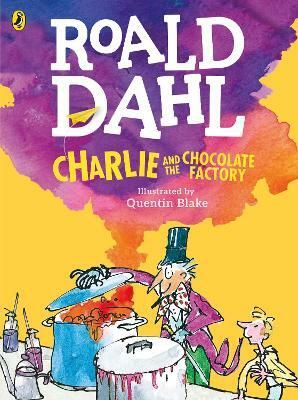 Roald Dahl's Charlie and the Chocolate Factory in glorious full colour. Mr Willy Wonka is the most extraordinary chocolate maker in the world. And do you know who Charlie is? Charlie Bucket is the hero. The other children in this book are nasty little beasts, called: Augustus Glo... read full description below. Roald Dahl's Charlie and the Chocolate Factory in glorious full colour. Mr Willy Wonka is the most extraordinary chocolate maker in the world. And do you know who Charlie is? Charlie Bucket is the hero. The other children in this book are nasty little beasts, called: Augustus Gloop - a great big greedy nincompoop; Veruca Salt - a spoiled brat; Violet Beauregarde - a repulsive little gum-chewer; Mike Teavee - a boy who only watches television. Clutching their Golden Tickets, they arrive at Wonka's chocolate factory. But what mysterious secrets will they discover? Our tour is about to begin. Please don't wander off. Mr Wonka wouldn't like to lose any of you at this stage of the proceedings ...Listen to CHARLIE AND THE CHOCOLATE FACTORY and other Roald Dahl audiobooks read by some very famous voices, including Kate Winslet, David Walliams and Steven Fry - plus there are added squelchy soundeffects from Pinewood Studios! Look out for new Roald Dahl apps in the App store and Google Play- including the disgusting TWIT OR MISS! inspired by the revolting Twits. ROALD DAHL began writing after a 'monumental bash on the head' sustained as an RAF fighter pilot during World War II. His first children's book, James and the Giant Peach, was published in 1961 and each of his subsequent books became bestsellers. He died in 1990, aged 74. QUENTIN BLAKE was knighted in the New Year's Honours - which means his full title is Sir Quentin Blake, although we can still all go on calling him Quentin as usual.